Welcome dear readers, to this special part of the Ravenclaw yearbook. As you could have guessed from the title, here, we will have a more thorough look upon Ravenclaw summer camp and its history from its inception. My name is Arnora and I will be your guide around our museum of this wonderful summer activity. I am pretty sure that you wonder what you will see in this display of history. Well, just that! I will explain what sort of camps were held in the past and you will also be able to see the things that were created during them. Let us start, shall we? 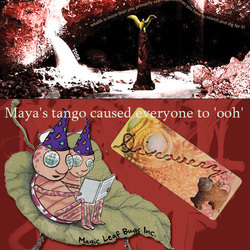 It was in the summer of 2006 that a Ravenclaw prefect named Aphelia Starr had the idea to create an event that would occur over the summer and not during the school year. It is a known fact that the summer is the death period for Hogwarts and in order to bring in some fun during it, a Ravenclaw Summer Camp had been born. Before we continue, the things you will see in this mini museum are a summary of all the wacky things made, done and said during the summer camps. The idea of summer camp in 2006 was to divide the eagles in four cabins with one or two camp leaders. It was a wizard derivation of an actual muggle idea. Over here to you see the proud and mighty banner from that time, a work of art and as you can see what the name of the first ever Ravenclaw Summer Camp: Camp de Ciel. As I had already said, there were cabins in which they put the eagles and back then, they were named Bald Eagle, Crowned Eagle, and Golden Eagle. The point was that the cabins competed with each other in a lot of fun and friendly contests like avatar making and naming the summer camp. Those two small contests were also the ice breakers for the groups, and soon, new friendships were born between the eagles. Besides those activities Camp de Ciel also offered camp songs, ghost stories, roasted marshmallows, nature walks or strolls and, of course, awards. 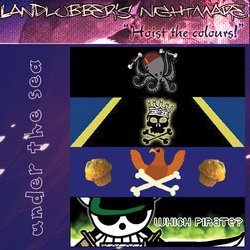 The next summer camp that was given birth to was the one in 2007, named Landlubber's Nightmare. Theme of this summer camp were pirates. If you look to the wall here, you see the banner that had been used back then. The concept of this summer camp, namely being divided into groups, and to compete in contests and to have a lot of fun, remained the same, but they got poofed up a little to fit the theme. This time we don’t speak of cabins, but of ships between them, we find the notorious names, such as The Black Pearl, The Flying Dutchman, and The Empress. During this summer camp, we see that the students and the staff made pirate flags, sang pirate songs, paid a visit to an adventure island, and went on a treasure hunt. Let us continue to the next section of this little museum. The next summer camp we encounter in our time line is the one of 2008. It was the summer camp where the eagles were made to believe they where archaeologists. I had heard a rumour that some of the first years were a bit too enthusiastic that time and that it took the staff four weeks to close the holes the eaglets made. Yes, the camp leaders back then really went wild with their archaeologist dig sites named the H.E.A.L.E.R.S, El Brujos, and Jolly Green Wizards. Over here, you can see the banner from back then, as always, a true masterpiece. Besides the supposed over-excited hole digging from the first years, Aestas Provocatio also offered an adventure across the world, pictures tell a thousand words game archaeologist pride and at the end, there was a collection of major finds that went down in the history of our house. When we continue to the next summer camp, that one being from 2009, we find a Quest of Time, and yes, you’ve guessed it, it was a time-traveling themed summer camp. In this summer camp, we find exiting names such as the Dalek Deities, Old Timers, and the Time Flyers. The point of this camp was to earn time crystals to travel back in time and to restore a time-space continuum. 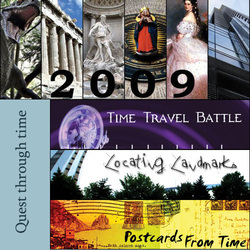 As for the super exciting activities, our brave time travelers participated in a time travel battle, made a time machine, went on a hunt through different eras, and made postcards from time. And with a quick glance to what was made then, we step on through to the summer camp of the past summer. That was the year that our staff really went wild, for they decided to ship us all participating students to Africa. The summer camp in Africa was really fun, until I got attacked by a jaguar. Anyway, that had passed, so people, when you all look to the left do you find a small glimpse of what was made back then. 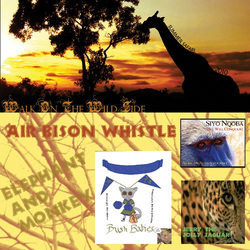 When we look back at the summer of 2010, we find on our explores’ map, the locations of Wild Card and Caravan Crew teams, the African Adventourists’ tent, cliff of the Jolly Watalii and the bushes of the Serengeti Searching Bush Babies. There were, as always, awesome activities held, such as packing useful items, racing with cheetahs and going on a big-game hunt. As you can see, we had a lot of fun throughout the years and I am sorry to say that this is the end of our tour. So, to the eagles out there, we hope to see you at the next Ravenclaw Summer Camp!